What Ubiquitous Office Application Was Originally Mac-Only? The Best Selling Fictional Language Dictionary Of All Time Is For Which Language? Long before Excel, Microsoft had a spreadsheet application named Multiplan (launched in 1982) that was pretty popular on CP/M computers (Intel-chip machines that ran the Digital Research operating system Control Program/Monitor, an operating system in active development between 1974 and 1983). Multiplan didn’t make much headway on MS/DOS where it competed with the radically more popular Lotus 1-2-3. When Microsoft rallied around the spreadsheet format again, it’s a curious historical footnote that they didn’t rally around Windows (at first). Microsoft Excel, the popular spreadsheet program that comes bundled with Microsoft’s ubiquitous Office software suite, wasn’t first released for Windows. 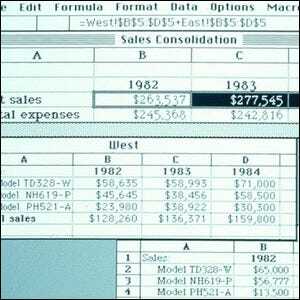 Excel 1.0 was, instead, released in 1985 as a Mac-only application. It didn’t appear on a Windows machine until a full two years later with the release of Excel 2.05. While many people think of Microsoft’s success in terms of edging out Apple, the widespread adoption of Excel by the early 1990s is actually one of Microsoft’s earliest and most important successes—when Excel outpaced Lotus 1-2-3 as the spreadsheet of choice, it established Microsoft as a serious software developer. In fact, at the time Excel for Windows came out, adoption of Windows was still so low that Microsoft bundled Windows with Excel (and not the other way around). People who wanted to use Excel installed Windows to get to it and, in the process, drove up Windows adoption rates.